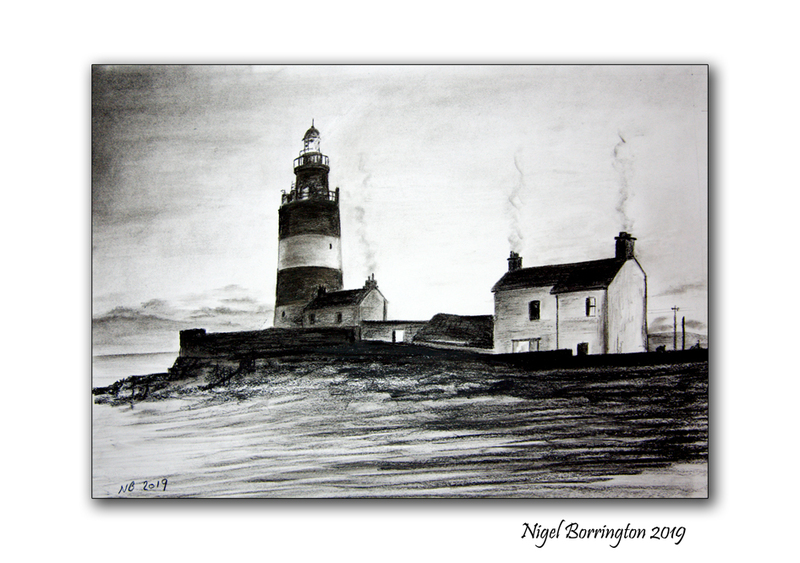 The lighthouse at Hookhead, county Wexford – Drawing using Charcoal and Pastel on a sheet of A2 cartridge paper. I have wanted to include the hookhead lighthouse in drawing for sometime so today I used a photo taken about 6 years ago taken one February evening on a walk around the base of the lighthouse looking out to sea. It was late evening just after sunset and light had just just been turned on, a magical moment to be there. The drawing today took about four hours to complete and is one of the drawing in the last week that I have enjoyed working on the most 🙂 ….. This entry was posted on February 8, 2019 by nigel borrington. It was filed under art, Art and craft work, art work, black and white, charcoal, drawings, Gallery, images of ireland, Irish coastline, Irish Landscapes, Pastels, Solo images and was tagged with art, charcoal, county wexford, drawing, Hookhead lighthouse, Ireland, Irish coast, irish landscape, irish lighthouse, Lighthouse, Nigel Borrington, Pastel. No corrections needed just help ! Thank you for this Nigel I’m going to check it out now! 🙂 Happy weekend to you!